Scrum master can communicate the progress of his team using Program Board in Metronome. Metronome displays the completed stories and features with a strikethrough. Metronome displays the total number of story points committed during iteration planning and total number of story points completed in the iteration thus far. Metronome calculates the percentage of story points completed by the team for the iteration. 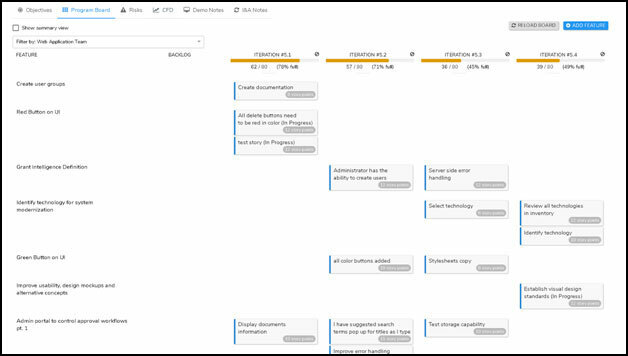 The progress of the team is visually displayed by a progress bar.This is a great tool for tracking the team’s progress and also for forecasting any delays at the program level. 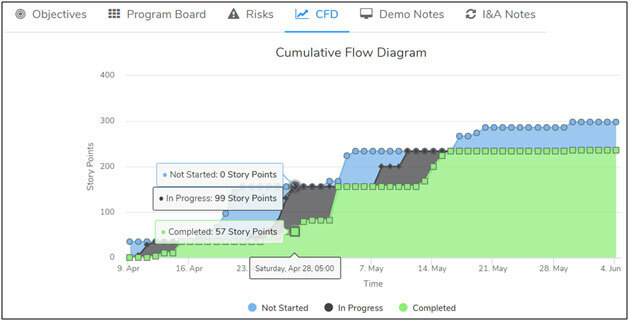 Using the Cumulative Flow Diagram scrum masters and the RTE’s can easily the check the work accomplished, work in progress and the work yet to start in the backlog. An important aspect of Inspect and Adapt ceremony is to quantitatively review and analyze the data collected during the entire Program Increment. Teams would greatly benefit the help of a tool to capture data during the execution of Program Increment. Metronome helps organizations by capturing information during the various ceremonies in the Program Increment. This information is presented visually in the form of charts, graphs and in a tabular format. With the help of these visual aids, Business Owners, RTEs and other stakeholders at the program level can quickly and easily analyze the data and trends, identify potential issues and facilitate the Inspect and Adapt ceremony. Metronome also helps to capture lessons learned, improvement ideas, solutions to problems discussed during the problem-solving workshops and the system demo in a central place. This will enable teams to have a one-stop shop, a “single version, of truth” for all information pertaining to the Program Increment.